This month, which is National Fruits and Vegetables Month, give a little extra thought to the naturally grown foods that you eat (hopefully) on a daily basis. 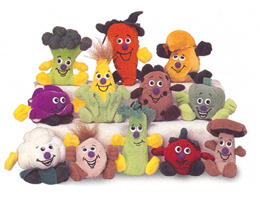 One thing you can find scattered around the offices here at NCES are members of the Fruit and Vegetable Seedies. 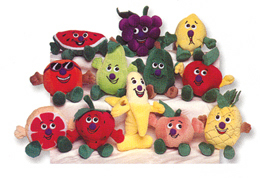 We know they’re for kids, but there’s nothing quite like having a friendly, smiling fruit or vegetable looking your way when you’re going about your daily business. The fact of the matter is: it’s good to have healthy reminders around to keep you in the nutritious mood. Children especially, are more prone to picking up good nutrition habits, just by being exposed to it. Having kids help prepare meals and pick out the items for the meals gives them a sense of control when it comes to their nutrition, and gives you a chance to educate them a little bit on what might be best for them to eat. One of the biggest areas they get their habits from is you. Leading by example works well in many situations, and when raising a child, it’s no exception. Just by eating well yourself, you’ll be giving your own child that much better of a chance to develop good eating habits in the future. Of course, the Fruit and Veggie Seedies probably wouldn’t hurt your odds either. Food can always seem more enjoyable when it’s got a big pair of eyes and a silly smile with it. Check them out for yourself in our catalog, in the ‘Educated Kids’ section, or by searching Item #’s 2661 and 3001 at www.ncescatalog.com.